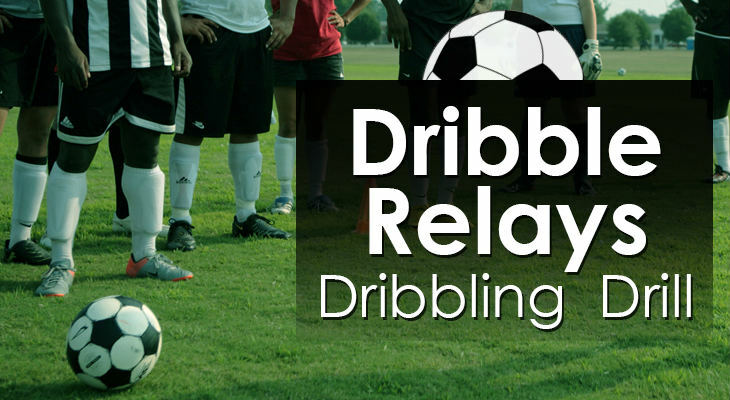 ​Using soccer dribbling drills that improve your players is a must for all coaches who want to give their players an increased chance of success in the future. All dominant soccer players at every level have the ability to control the ball and get anywhere they want on the pitch. These players had the ability to easily beat the player who was in front of them using a variety of creative dribbling moves. That's why it's crucial that all soccer coaches are using soccer dribbling drills that will allow their players to be creative and develop great ball control. Players who are able to control the ball while keeping it close to their body are often the best dribblers. Doing so makes it far harder for the defense to tackle them! Keeping the ball close also allows players to quickly change speed and direction any time a gap opens up in the defense. Any time you're able to get your opponent off-balance, you must be able to take advantage of it quickly! Beating a defender one-on-one is pointless if the player has no idea what to do with the ball next. Players must be able to look up frequently to read the play and understand where the gaps are and how they can set up their teammates. Players partner up and compete against each other through a series of 'gates' laid out in the playing area. Each round, one partner will be the offensive player trying to dribbling through the gates successfully while their partner tries to steal the ball. 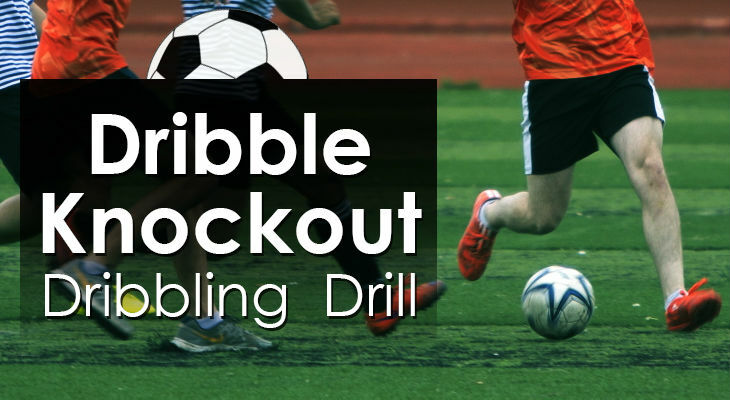 This competitive 1-on-1 drill is aimed to work on individual dribbling skills and ball retention. The dribbler must use good ball control and body positioning to successfully keep the defender from stealing the ball. Change of direction and speed are also trained in this drill for both the offensive and defensive player. Set up the playing area by lining out a box with cones for the boundary. Set up multiple “gates” of cones (approximately 3 feet wide) inside the playing area. There should be the same number of gates as there are pairs of players. Players partner up with one soccer ball per pair. To start the round, pairs spread out inside the playing area. One player is designated the offensive player with the ball while the other player is selected as the defender. Rounds can be 30-60 seconds depending on the age and fitness of the players. ​On the coach’s whistle, the players on offense start dribbling inside the playing area trying to dribble through as many gates as possible for the decided period of time. While the offensive players dribble, the defenders are trying to steal, or prevent, the ball from being dribbled through a gate. If the defenders win, or deflect, the ball from the offensive player, the ball is given immediately back to the offensive player and play is resumed. The offensive player gets one point for each time they dribble through a gate without hitting any of the gate’s cones; hitting a cone will not count as a point. After the set period of time, the players switch their roles and repeat the process. Run the drill for 4 - 6 rounds for each player on offense and the player with the most points at the end of the rounds wins. Number of Rounds - Select the number of rounds based on the age, skill, and fitness of the players you’re coaching. Size of the Playing Area - Depending on the skill level and the number of players, increase or decrease the size of the playing area. There should be plenty of room for the all the players to dribble around in. Switch Opponents - Have players find a new opponent after they have defended and attacked their current partner. Offense Switches on a Turnover - One player per pair starts with the ball, but if the player defending wins it from the offensive player, the defender now becomes the offensive player and the offensive player now becomes the defender. The offensive players are not allowed to dribble through the same gate twice in a row for a point. Players are responsible for keeping track of their own points. Instruct players to use their bodies well to protect the ball. Players should be encouraged to remain calm under pressure and find a way to dribble through gates using moves, fakes, and change of direction and speed. Three teams compete against one another in this 1-on-1-on-1 game. One player from each team competes at a time and attempts to dribble the soccer ball through one of their opponent’s goals while their opponent’s attempt to steal the ball and score in the same manner. Develops 1-on-1 skills in a more difficult setting with more defenders and options. Players increase their dribbling and defensive skills as well as their decision-making skills. Use six flags, or cones if flags are not available, to form three goals, 3-5 yards wide, and position each goal about 15-20 yards apart from each other, forming a triangle. Increase, or decrease, the playing triangle area depending on the players’ skill and age. Split the players into three teams of 3-5 players per team and assign a jersey color to each team. If there are more than five players per team, try to set up another field and decrease the number of players per team so that the players can get more repetitions. Position each team behind a goal. Put all the soccer balls outside of the playing area with the coach. The coach starts the game with a pass to the middle of the triangle where the first player from each team attempts to run and win possession of the ball. The player that takes possession of the ball now attempts to score by dribbling the ball through either of their opponent’s goals. The two players without the ball defend their own goal and attempt to steal the ball from the offensive player and score by dribbling through one of their opponent’s goals. When a goal is scored, the three current players are done with their turn and return to the back of their team line. The player who scored passes the ball to the next player in line for their team. The player receiving the pass from the scorer enters the field by dribbling and attempts to score while the next two players in line from the other two teams attempt to defend and win the ball to try and score themselves. The game continues in this manner until one team scores a set number of goals (for example, 10 goals) or a time period is reached. Pass to score – Instead of dribbling through the goal, players are allowed to score by passing the ball through their opponent’s goal. Vary the distance between the goals, depending on the players’ age and skill level. Instruct the players to use change of direction and speed to help them get past defenders. Remind the players to keep the ball close so that they can quickly react to the defenders and maintain possession. Encourage the players to take on their opponents with confidence and to try new moves and fakes in order to see what works best. Challenge the players to maintain a good vision of the field and see where the space and defenders are. One player at a time attempts to dribble past two defenders and a goalkeeper before scoring. Develops 1-on-1 confidence and skills like dribbling, vision, and change of direction and speed. Good for players to work on their finishing technique and confidence around the box. One full size goal is needed at one end of the field. At least one goalkeeper is needed. If there are extra goalkeepers, have the goalkeepers rotate every few repetitions. Set up one gate, about 7-10 yards wide, 15-20 yards straight out front from the goal. Set up a second gate, 5 yards in front of the first gate. The second gate should be the furthest gate away from the goal. Set one cone down 10 yards away from the second gate. This will be the starting point for the offensive players. Two players start as the defenders, one between the first gate, and the second one between the second gate. The rest of the players form an offensive line behind the cone at the top of the activity. Each offensive player should have a ball, if possible. The first player in the offensive line starts the drill by dribbling towards the first defender and attempts to dribble past the defender and through the first gate. Once the attacker dribbles through the first gate, the first defender is done defending, and the attacker attempts to dribble past the second defender and through the second gate. The defenders are allowed to move freely along their gate line and attempt to prevent the attacker from dribbling across their line. After dribbling past the second defender, the attacker now attempts to dribble around the approaching goalkeeper and score. After scoring, the attacker retrieves their ball quickly, and then walks around the outside of the drill and returns to the back of the offensive line with their ball. If the defenders, or goalkeeper, win the ball from the offensive player at any point, the offensive player’s turn is over and they must retrieve their ball and go to the back of the offensive line. The next offensive player in line can begin their turn after the player in front of them as scored, or lost the ball to the defenders or goalkeeper. The drill continues in this manner for 2-3 minutes before players rest and rotate positions. The next two offensive players in line become the new defenders while the old defenders take their positions in the offensive line. Start slow – Good for younger, or less experience players who are still working on their dribbling skills. Instruct the defenders to defend easily and not to attempt to win the ball. This will help players work into the drill and gain confidence. Increase the intensity of the defenders as see fit. Vary the distance – Increase the distance between the defenders’ gates to increase the speed at which players can dribble. Add defenders – Add another cone gate and a defender to increase the difficulty for the attackers. Subtract defenders – If the second defender is giving players a tough time and the goalkeeper is not getting much work, get rid of the second defender and gate, and just have one gate and defender. Free moving defenders – Defenders can step off their gate line in order to increase the difficulty for the attackers. Defenders can not defend behind their line, but they are encouraged to take a few steps off their line in order to time their tackles and movement better. Encourage the players to be creative and to find out what moves work best for them. Each player will have a different method, or preference, that works best for them for getting around players. Help players find their best option and perfect it. Have the players get really good at one or two moves before trying all the moves in the book. Remind the players to dribble at speed while also keeping close control of the ball. Dribbling at speed will make them harder to defend, but they must still keep the ball close in order to protect it. Challenge to players to be decisive when they take a defender on. The players should decide on a move before getting too close to the defending and losing the ball. Encourage the players to look up when dribbling in order to judge the distance between them and the defender and to read the defender’s body to see the best way to beat them. Every player has a soccer ball that they dribble inside the playing area while attempting to knock other players’ soccer balls out-of-bounds. Once a player has their soccer ball kicked out-of-bounds, then that player dribbles around the on the outside of the playing area until the next round. The last player inside the grid wins. Develops dribbling, ball control, and awareness in an enjoyable and competitive game activity. Players compete against one another while also improving their ability to protect their ball from defenders. Use this drill as a warmup activity for older players, or as a fun way to get young players moving and excited about the game. Use several cones to mark a playing area. The shape of the area in not important. A circle, rectangle, or square shaped playing grid is acceptable. Vary the size of the area depending on the number of players involved. All the players start inside the playing area with a ball. On the coach’s signal, the players start dribbling inside the area. Players are free to move in any direction inside the box. While maintaining control of their soccer ball, players attempt to kick, or tackle, the other players’ soccer balls out of the playing area. If a player’s soccer ball goes out-of-bounds at any point, then that player retrieves their ball and dribbles around the outside of the playing area for the remainder of the round. If a player dribbles their ball out-of-bounds, then they are out for the remainder of the round as well. Players must keep their soccer balls close to them at all times. Players are not allowed to leave their ball and run after other players without their ball. Players who do so should be warned or disqualified for the remainder of the round. The last player dribbling inside the playing area is the winner of that round. After the round is completed, all the players are back in the game and a new round is started in the same manner. Play as many rounds as needed. Weak foot – Have the players dribble with their weaker foot only. Contact surface – Specify the part of the foot that the players must use to dribble. Changing playing area – As more players are knocked out, place new cones inside the playing area that make the space smaller, creating a more difficult space for the remaining players. Do not stop, or pause, the round when doing this, rather give instructions to the players that new boundary lines are being created and that they must move into the new space immediately. This is a great way to decrease the time it takes for each round and forces players to confront each other. Instruct the players to keep close control of their soccer ball when dribbling. This will increase their chances to stay inside the grid longer and compete to be the last player. Challenge the players to use their bodies to protect their ball and use moves, or cuts, to avoid other players attempting to knock them out. Encourage the players to keep their eyes up and see the field. This will enable them to avoid defenders early and dribble into open space. Remind players to pick their moments to attack another player’s soccer ball. Players should always be looking for a chance to knock another player’s ball out-of-bounds. Two teams compete against one another by dribbling through a series of three gates and then back to the starting point as quickly as possible. The first team to get their players all the way through wins the round. Develop dribbling and ball control at high speeds. Great warmup game for older players to compete and work on their dribbling under pressure. Fun game for young players to enjoy and race against each other. Setup two, parallel lines of six cones (three gates) with by 8-12 yards in between each line. Increase, or decrease, the space between the two lines depending on the players’ skill and age. Two different sets of colored cones are needed. Red and yellow will be used for this example. One line should be the following: red gate, yellow gate, red gate. The other line should be the opposite: yellow gate, red gate, yellow gate. Place two cones at the beginning of the two lines to indicate the starting point for each team. Divide the players into two, even numbered, teams and assign each team to form a line behind one of the two starting cones. Tell each team which colored gates they will be dribbling through. One team will only dribble through the red gates while the other team will only dribble through the yellow gates. The player at the front of each line needs a soccer ball. On the coach’s signal, the first players for each team dribble through their first assigned colored gate as quickly as possible and then cross over to the other line to dribble through their next assigned colored gate. The players dribble through all three of their colored gates and then dribble down the middle of the two cone lines back to the starting line as possible. The players stop the ball on the starting line for the next player in their line to start their turn and complete the same process. The first team to complete the course wins the race. Teams need to complete one, two, or three rounds before winning the race depending on the coach’s instructions. Play as many rounds as needed. Weak foot – Have the players use only their weaker foot to dribble. Various dribbling techniques – Give the players a specific foot part they must use to dribble. Inside, outside, bottom, etc. 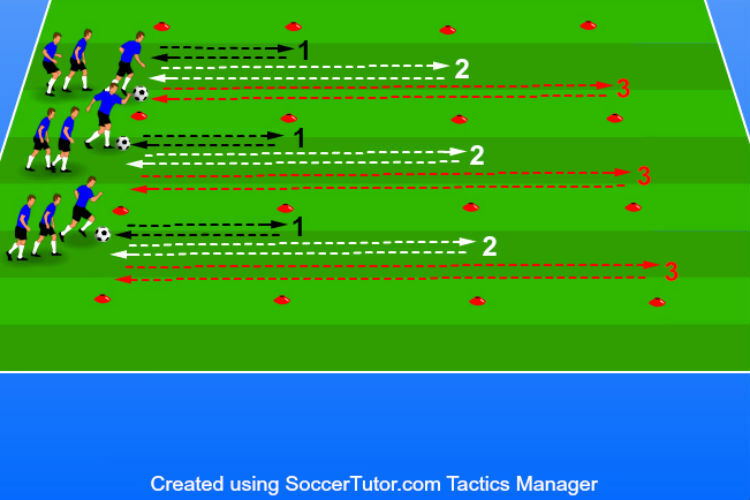 Size – Increase the distance between gates to force players to work on dribbling over longer distances. More gates – Add more gates to increase the distance players must dribble for each turn. Have four, five, or six gates to challenge players and work on fitness. Challenge the players to dribble as quickly as possible while keeping the ball under control. Players should be encouraged to test themselves and go out of their comfort zone to improve. Teach the players to take bigger touches in the open field, and then smaller touches when getting around the gates. Taking bigger touches allows players to cover more ground faster, while smaller touches allows players to turn more quickly. Remind the players to keep their eyes up in between touches. This will help players avoid colliding as they cross over to their other gate and help them build good awareness habits. Players race against each other by dribbling, down and back, through a series of cones laid out and then stopping the ball for the next player in line to repeat the process. The first team to have all its players complete the task, wins the relay race. Develops a player’s dribbling ability and technique. Use as an enjoyable team warm up activity for older, more developed players, or use as a main drill for younger, or less experienced players. Set up two parallel lines of cones. Each cone line should have at least 6 cones laid down with 1 yard between each cone. Decrease the space between each cone depending on the players’ age and skill. Setup one starting gate at each cone line, about 3 yards away the first cone in the cone line. Use two cones, about 2 yards wide, for each gate. This will be used as the start and finish line for the players. Split the team into two, even numbered groups and assign each team to form a line behind their starting gate. First player in each line has a soccer ball. Only one soccer ball per team is needed. On the coach’s signal, the first players in line with the soccer ball begin dribbling through their line of cones in a zig-zag pattern. Once the players dribble to the end of the cone line, they turn around and dribble back through the line of cones using the same zig-zag pattern. When the player dribbling gets back to the starting gate, they stop the ball on the line, and the next player in line begins their turn. Players must dribble through each cone using a zig-zag pattern. If a player misses a cone, they must go back and complete that cone. The first team to have all its players successfully complete the task and cross the finish line wins the race. Continue this drill for a set period of rounds. Practice time – Instead of every round being a race, give the players a time limit to practice without a competition format. Give players 4-6 minutes to work on the task at hand if the race style is too much. 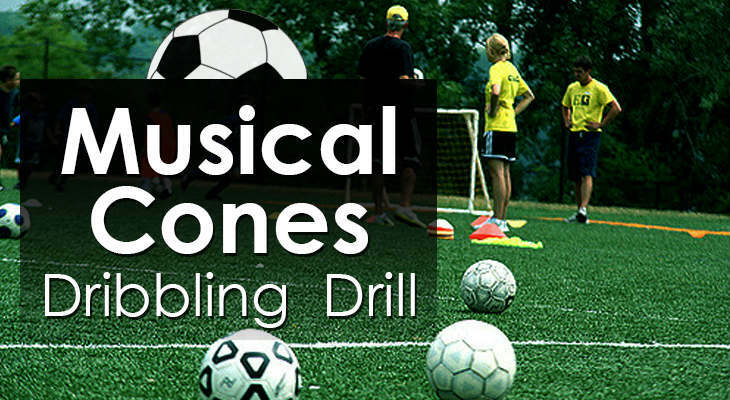 Dribble patterns – Give the players different dribbling patterns that they must perform to get through the cones. Have the players use only their right foot, left foot, insides of the feet, outsides of the feet, bottoms of the feet, etc. Distance – Depending on the player’s age and skill level, move the cones closer together to increase difficulty. 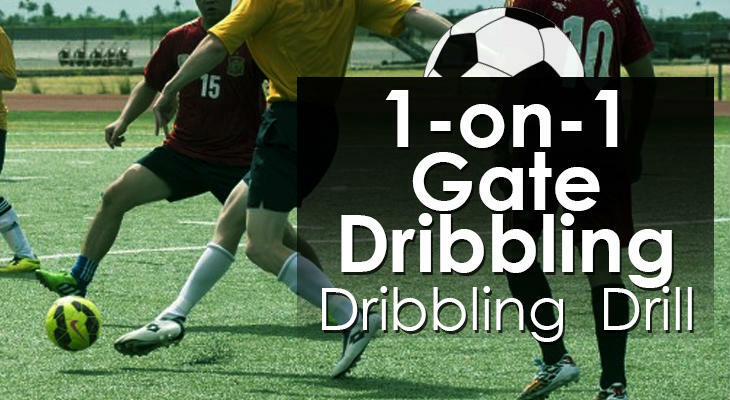 Challenge the players by making them use different surfaces of their feet when dribbling. 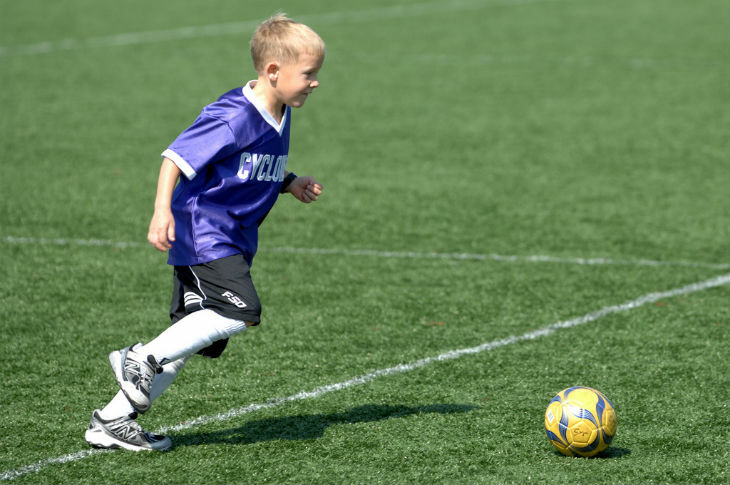 Give them different dribbling patterns to keep them interested. Make a competition out of it to force players to move more quickly. Players of all ages love to race. It is a great way to have some fun and encourage players along. Give players a practice round first, if needed, and then have the real competition. Teach the players to keep the ball close to build good habits of protecting the ball from their opponent. Encourage the players to try to keep their heads up and maintain the vision of the field while dribbling. Players start at the corners of the grid and dribble to the center cone where they perform a move and then dribble back to their corner. Develops players’ dribbling and cutting abilities. Players work on keeping the ball close and using simple ball cuts to turn with the ball. Use four cones to mark a square grid, 20-30 yards wide, depending on the players’ age and skill level. Place one cone in the center of the grid. Divide the players into four, even numbered groups, and assign each group to a different corner of the square. Instruct each group form a line behind their corner cone. Every player should have a soccer ball. If there are not enough soccer balls for each player, then make sure there is at least one ball per group. On the coach’s signal, the first player in each line starts dribbling towards the middle cone. The four players dribble, under control, at the same time to the center cone. When the players dribbling arrive to the center cone, they perform a change of direction move, or turn, and explode back to their corner. The next player in each line can start their turn as soon as the player in front of them completes their turn at the center cone. The drill continues in the same manner for a set period of time (5 minutes, for example). After each round, teach the players a specific move to perform at the center cone. 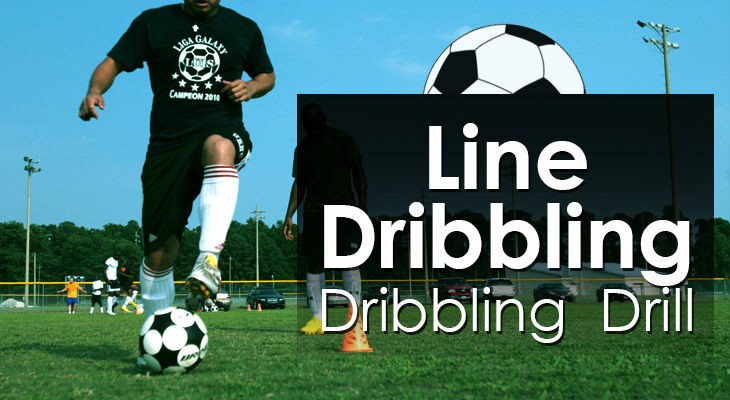 Dribble type – Have the players dribble using different foot surfaces or rules: inside, outside, left, right, bottom, etc. Dribble moves – Specify the move that the players will perform at the cone. Rotation – Instead of dribbling back to their corner, have the players change direction at the middle cone and dribble to the back of the line to their right, or left, depending on the instructions given. Remind the players to focus on using the proper surface of the foot when dribbling, and to keep the ball close when dribbling. This will insure the players can protect the ball and change direction quickly. Instruct the players to focus on their change of speed and direction. Challenge them to explode after their move so they can create separation between themselves and their defender. Encourage the players to try to keep their eyes up when dribbling in order to build good habits and vision. Players dribble to each of the four cone lines marked. Players complete this shuttle by dribbling to the first line and then back to the start, then to the middle line and back, and finally the furthest line and back. At each line players must make quick, tight turns to be as efficient as possible. 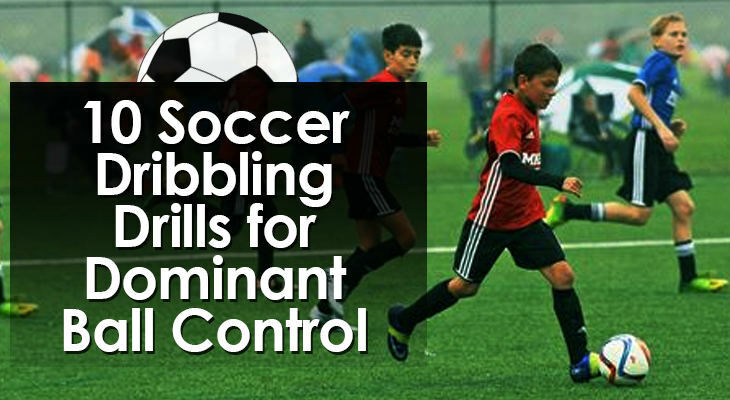 Develops game like turns and dribbling control. Players must cover the ground as quickly as possible while also measuring their touches to turn quickly at each line. Suitable as a warmup for older players, or use as a more enjoyable activity for younger players. Add competition to increase the intensity. Setup four, parallel cone lines with four cones in each line. Each cone should be five yards apart. This will create three alleys for players to dribble down. Create more alleys as needed. Divide the team into groups of 3-5 players and assign each group to an alley. Each group lines up on the bottom of their alley and forms a line behind the first player. Every player should have a soccer ball. If there are not enough soccer balls, then each team needs just one soccer ball to share. On the coach’s signal, the first player in each group dribbles to the nearest line, five yards in front of them. Once the soccer ball crosses the nearest line, players turn, or cut, 180 degrees and dribble back to the starting line. At the starting line, the players turn, or cut, and dribble to the next line, ten yards away. Once the ball crosses the ten-yard cone line, the players turn, or cut, and dribble back to the starting line. At the starting line, the players turn and dribble to the furthest line, then back to the starting point, where they finish their trip. The next player in line begins their turn once the player in front of dribbles across the finish line and repeats the same process. Players will complete one, two, or three trips per round depending on the players’ age, skill, and fitness level. Make sure players get the proper amount of rest between each trip. Competition – First team to get all their players through, one at a time, and across the finish line, wins. Various dribbling techniques - Specify the way the players must dribble – inside / outside foot, soles, etc. Various turns and cuts – teach players different turns, or cuts, to perform at each line. Inside the foot cut, outside the foot cut, bottom of the sole turn, etc. 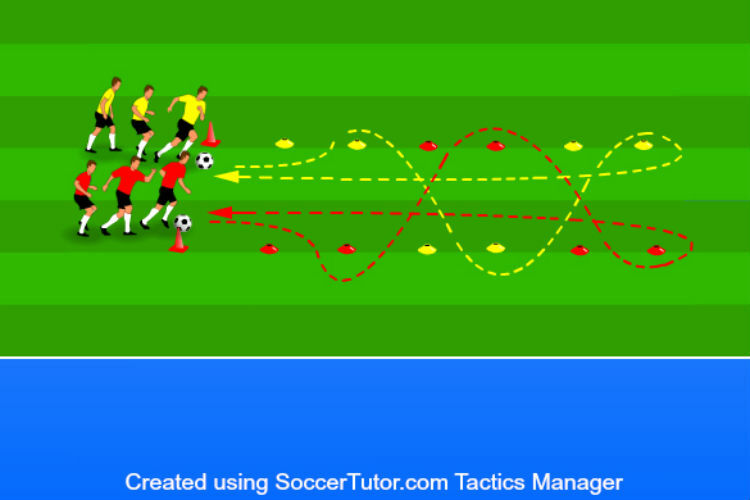 Fitness – This activity can be used to build players’ fitness levels while also getting touches. Teams must complete two, three, or four rounds before resting. Challenge the players to push themselves to dribble as quickly as possible while maintaining control of the soccer ball. This will help players develop their dribbling and turning skills at a higher speed. Unless this is being used a fitness activity, give players plenty of rest between each of their trips to ensure they are focusing on dribbling and turning at high speeds instead of their tired legs. Use smaller distances for younger, less experienced players. Use larger spaces for older, or more experienced players. Educate the players to take larger touches to cover more ground and smaller touches when a change of direction is needed. The varied distances are important for players to find the type of touch they need between each line. Remind the players to look up between touches. This builds good awareness habits and will help players and their vision in games. Like musical chairs, players must dribble around inside the grid until the music stops, or the coach gives a signal, and then knock over a cone inside the grid with their soccer ball. The player who does not knock over a cone at the end of each round, is out for the remainder of the game. 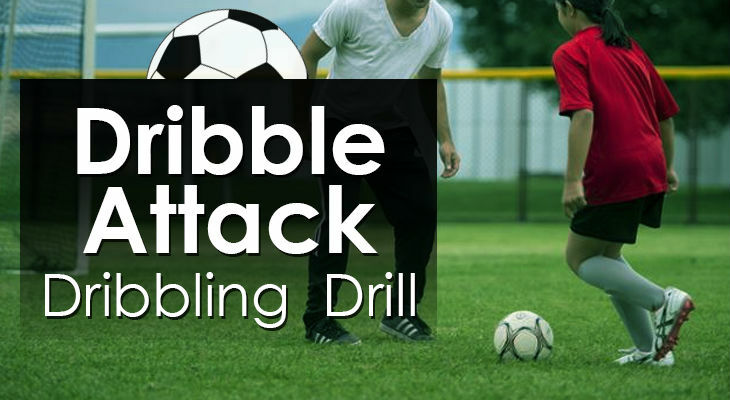 Develops dribbling and ball control skills in a fun manner. The activity also encourages players to maintain awareness and find the nearest cone. Set up a playing grid (size may vary depending on the number of players in the group). A circle or rectangular shape works well. Set up tall cones randomly within the grid. There should be one less tall cone than the number of players in the grid. The coach prepares a music player (a whistle can be used as well). The coach starts playing music, or blows the whistle, to start each round. Players begin dribbling inside the grid. When the music stops, or the whistle is blown again, each player must quickly dribble to the nearest cone and knock it over with their soccer ball. The player who does not knock over a cone is out for the remainder of the game and continues to dribble, or juggle outside of the playing area. Before starting the next round, players reset the cones and the coach takes out one random cone so that there are more players than cones inside the grid. Players must constantly dribble their ball inside the grid. Players are not allowed to stand still otherwise they are warned, or disqualified for the remainder of the game. The game continues in this manner until there is one player left inside the grid and is declared the winner. Repeat the game as many times as needed. Take out more than one cone – To increase the speed of each game, take out more than one cone after each round. This means more players will be out after each round. Take 2, 3, or 4 cones out depending on how quickly the game needs to move. Remind the players that they must constantly be dribbling and moving throughout the grid. Players must keep their ball rolling to participate in the game. Encourage the players to keep their heads up and maintain vision of the field. This will allow players to know where the nearest cone is when the music stops. Challenge the players to dribble with speed and to change direction quickly to get to cones. Teach the players to have some fun while playing and to enjoy the music if it is playing. Players play a soccer game like the children’s game 'Sharks and Minnows'. One player starts as the 'shark', attempting to knock other players’ the soccer balls out the designated area. As players get their soccer ball knocked out-of-bounds, they become a shark as well and kick other players’ soccer balls out. The last player left with their soccer ball is the winner of the round. 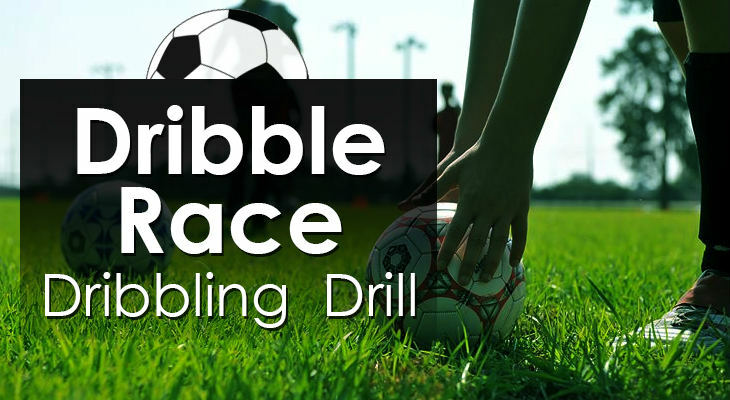 Super fun and enjoyable for young players to develop their dribbling skills. Players will increase their ball control as well as their awareness and defensive tackling skills. Use several cones to mark a square-shaped playing grid, 20-30 yards wide (depending on the number of players in the group). Every player starts with a soccer ball and inside the playing area. One player is selected as the “shark,” and starts outside the playing area without a soccer ball. On the coach’s signal, players begin dribbling inside the playing area. After 5 seconds, the 'shark' is released and enters the playing area attempting to kick players’ soccer balls out-of-bounds. Players dribbling must stay inside the playing area and protect their soccer ball for as long as possible. Once a player has their ball knocked out, that player now becomes a shark and attempts to knock out other players’ soccer balls. The game continues in this manner until there is only one player left with a soccer ball. The last player with their soccer ball is declared the winner of that round and starts the next round as the shark. Steal & Keep the Ball – Instead of attempting to kick the soccer balls out, the sharks attempt to steal other players’ soccer balls. Once a shark has stolen a soccer ball, they are no longer a shark while the player who lost their ball becomes a new shark. This means that the sharks will constantly be changing, but not multiplying. Start with 1, 2, or 3 sharks for this variation. Teach the players to protect their ball by using proper body position to shield the opponents. Remind the players to use change of direction and speed to get away from the sharks. Instruct the players to always keep the ball close so that they can react quickly to approaching sharks and get away from them. Encourage the players to keep looking around the playing area and see where the sharks are. Players should dribble away from sharks and into open space.